Victory in Boyle Heights:	CSO and Parents Gain "Clean Schools" | Fight Back! Young and old say "Education is a right!" Los Angeles, CA - Parents here were fed up with garbage covered school grounds. So along with the Community Service Organization, they decided to do something about it. "Our schools should be as clean as those in the west side or as those of the rich," said a CSO parent member. "Let's see their children digest education from a dirty, filthy plate." The short-term goal to clean up trash cans has become a victory for the Community Service Organization in the Boyle Heights neighborhood. Under the leadership of CSO, the "Clean Schools Campaign" has broadened. CSO members and parents have moved to Hollenbeck Junior High to demand the campus be cleaned up. The campaign is gaining momentum. On Aug. 8, CSO and a group from Boyle Heights, including children, led chants saying, "¿Que Queremos?" and the crowd responded, "¡Justicia!" and "¡Escuelas limpias, ahora!" This is one proof of the energy and commitment of El Centro CSO and the parent-led group. CSO held the community walk from Bridge Street to Roosevelt and Hollenbeck schools through the streets of Boyle Heights, stopping by each of the neighboring schools. 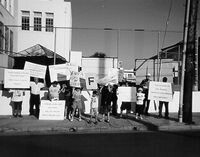 Children and youth that attend those schools proceeded with their parents, holding signs and leading chants with the bullhorn. These young Chicanos realize that their schools are in need of better conditions. 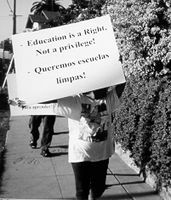 The Clean Schools Campaign is a beginning movement to demand educational justice and educational rights for Mexicanos/Chicanos and other Latino groups in Boyle Heights. CSO and Boyle Heights parents challenged the Los Angeles Unified School District administration's failure to respond to the unhealthy and unsanitary conditions of schools in the east sector of Los Angeles. Schools in affluent areas are well maintained. In communities of color, that is not the case. The CSO parents' slogan was "What grade does your school deserve?" - making a parallel with the restaurant grading system and the food we eat. "What options would they choose?" said parents referring to the A, B or C options that were offered at the third negotiation meeting. Option A was a drainage system worth $15,000 and C was a fence with plastic sticks to block the spillage of discarded milk cartons and flies that accumulate from the neglected trash can area located by the children's playground. The group of parents and CSO members stood firm on their demand to obtain the best sanitary solution to the trash cans that affect the health and learning conditions of the children at Bridge Street Elementary School and the health of the surrounding Boyle Heights neighbors. After persistently putting heat on the L.A. County Health Department and L.A. Unified School District Maintenance management, CSO and the parents were able to get an enclosed trash can area with a drainage system to correct the long neglected trash disposal area. After this victory, CSO is continuing the "Clean Schools" struggle, strengthening the campaign with broad support from parents of the surrounding schools that backed the Bridge Street effort. Meetings are being held to determine demands and strategy for their neighboring school. "This is more than a trash can issue," stated a parent with children at Bridge Street Elementary, "it is about how our children are treated and what L.A.U.S.D. sees worthy for our kids. We will continue to support each other to demand justice. We are not selfish, we are not demanding educational rights for just our children - we are talking about the children of other Chicanos, Mexicanos, Afro-Americans and Philipinos in the poor areas." CSO and the parents of Chavez and Echandia culminated the struggle and victory with a celebration of unity to recognize the ongoing struggle for education and liberation. In a symbol of the efforts of the community, members of CSO held a fundraiser called La Culebra, representing the community walk and the fight back against the Los Angeles Unified School District.